1.- limpia los mejillones, con un cuchillo de sierra, y arrancando los pelos. 2.- pon los mejillones limpios en una perola sin agua y al fuego, que se abran al vapor. 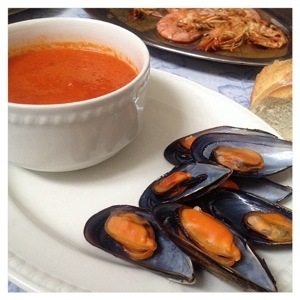 5.- con los mejillones abiertos, tira las tapas y guarda tal cual los mejillones en la otra. Sirve en un bol con la salsa, veréis que adicción!! 1 -. Clean mussels, with a serrated knife, and pulling hair. 2 – Put the clean mussels in a saucepan without water and to fire, which will open to the steam. 5 – with mussels open, pull the covers and save that which the mussels in. Serve them in a bowl with the sauce, you will see that addiction! Entrada siguiente Arroz con Calamares en su Tinta, con salsa de Ali Olí / Rice with Squid in its ink, with Ali Olí sauce.